Apple won't release an iPhone that can connect to 5G data networks until at least 2020, claims a new report out today. According to Bloomberg's sources, Apple is planning to delay its support for the next generation of high-speed mobile services coming in 2019, just as it did for previous generations. According to Bloomberg, Apple delayed support for previous mobile network upgrades because it accurately predicted that the first versions of rival smartphones would suffer from problems like poor coverage. 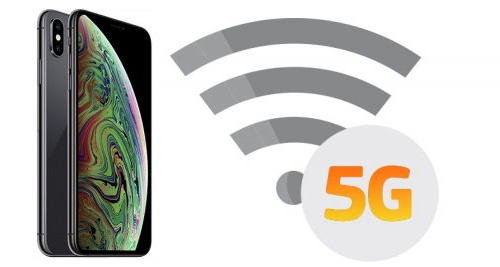 However, 5G advocates argue that delaying support for the upcoming network upgrade is a bigger risk for Apple, since it represents a much bigger speed boost over previous generations, making the leap from 4G to 5G significant enough to become a major selling point for new devices. 5G advocates believe the danger for Apple is that it will be left behind by rivals like Samsung, who could exploit the delay and attract more consumers to its Galaxy smartphones, which are expected to support 5G networks next year. Likewise, Chinese mobile makers Oppo and Huawei have also signaled that they plan to offer 5G phones. Bloomberg suggests that Apple's decision to wait another year before supporting 5G could be related to the company's feud with Qualcomm, a leader in 5G-enabled chips, and it's partnership instead with Intel, which won't have 5G chips ready in time for 2019 phones. Rumors late last year suggested Intel and Apple were already working on 5G chip technology for future iPhone devices. Intel is said to have thousands of people working on 5G tech to catch up with Qualcomm and win Apple's 5G modem contract. Huawei and Samsung have the manufacturing infrastructure to build 5G modems, but Apple is said to be unlikely to use chips from its smartphone rivals, who could struggle to produce adequate supplies for the iPhone's huge volumes anyway. Whatever the reason behind the delay, some analysts believe Apple's decision could have an impact on its iPhone customer base. "Apple has always been a laggard in cellular technology," said Mark Hung, an analyst at Gartner who spoke to Bloomberg. "They weren't impacted in the past, but 5G is going to be much easier to market. But if they wait beyond 2020, then I think they'll be impacted." Classic Apple. Be the last one on the block to show up to the party, and charge the highest price for the honor. Every product that could be out in 2019 is now pushed to 2020. Every other company will beat Apple to the punch. "Think Different. Act much later." You lost me at Bloomberg. I will upgrade only in 2020 then. Ill be honest, I hardly even use the speed of LTE, let alone a 5G option. 5G seems more geared for home internet. Which means by the time these 5G iPhones come out Apple will be charging $2k for the base model with an LCD display. Considering you have a new iPhone, a new Apple Watch, and a new MacBook Air, that seems like a reasonable decision anyway. 5G is meaningless. Burn through data caps faster. LTE is more than fast enough for anything a phone would need to do. Apple has always waited a year or two after new cell / mobile tech comes out to get the 2nd generation tech before putting it in their phones and it's never hurt them (past 1st generation tech - 4G if memory serves, had power consumption problems that was flagged in reviews at the time...but the 2nd gen 4G tech didn't, which is what Apple used, good choice on their part). 5G is pointless, expensive and invasive to implement, extremely unhealthy, and in general a new machine for patent profits. Im still confused why there isn’t a serious backlash.